Many paths lead to Rome … and to our small, charming Salzburg old town hotel as well. For vacation, business or a city trip, one thing must happen before all else: your arrival! Whether you come by car, train, bus or plane – here are many helpful hints for a relaxed arrival. Please note that the reception remains open until 9pm. If you plan to arrive and check in after this time, we kindly ask that you inform us in advance. For a trip to just a regular destination, you enter the address into your navigation device and off you go. 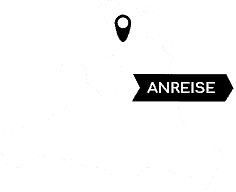 But due to the very unique location of the Hotel Weisse Taube at Kaigasse 9 – within the pedestrian zone of the old town of Salzburg – some devices might try to lead you into an area where cars are not allowed. If you are using a navigation device, please simply enter “Kajetanerplatz 1, 5020 Salzburg” as the destination address. As a guest of our hotel, you can park at the special rate of 9.00 euro per 24 hours in the Hypo Garage in Nonntal or 17.00 euro per 24 hours in the garage of the Barmherzigen Brüder. Both underground garages are video-monitored and are a short 5 – 10 minute walk from the hotel. We will be happy to provide you with detailed directions to the various parking facilities upon your arrival. Access to the hotel by car is only possible from Rudolfskai via Kajetanerplatz to Kaigasse. The entrance road is regulated by retractable bollards. Once you arrive at the barrier you will find an intercom on your left. Press the call button for “Weisse Taube“. The hotel receptionist will then give you an access code (made up of 6 numbers + the letter ‘B’). Entering this code using the keypad on the column will cause the bollards to be lowered, allowing you to enter and continue on to the hotel at Kaigasse 9. The easiest way to travel from the train station to the hotel is by taking one of the many taxis located to your right as you exit the station. The cost for the 10 – 15 minute trip (duration varies depending on the traffic) is about 10 euro per taxi. Or you could decide to take the bus. The O-Bus lines 3, 5 and 6 leave from in front of the main station, slightly to your left as you exit the station. A single-trip ticket currently costs 2.60 euros and can be purchased at the ticket counter within the train station, from the machine at the bus stop, or directly from the driver. Take any one of these lines to “Mozartsteg”. Just before the Mozartsteg stop, you will see a street on the right secured by retractable bollards that leads directly to Mozartplatz (with the Mozart monument). Follow this road for about 150 meters and you will find our hotel located on the left side at Kaigasse 9. Taking a taxi is quick and easy. The drive from the W.A. Mozart Salzburg airport takes about 20 minutes and costs around 18 euro. If you would like to opt for the less expensive option, you can take the O-Bus line 10 to the stop “Mozartsteg”. The single-trip ticket currently costs 2.60 euro and can be purchased at the “Newscorner” in the airport terminal, at the bus stop (machine) or directly from the bus driver. Take this line to the “Mozartsteg” bus stop. Just before the stop, you will see a street on the right (secured by retractable bollards) that leads directly to Mozartplatz with its Mozart monument. Follow this road for about 150 meters and you will find our hotel located on the left side at Kaigasse 9.